Image captured on 13 April 2018, by the MODIS instrument, on board NASA's Terra satellite. 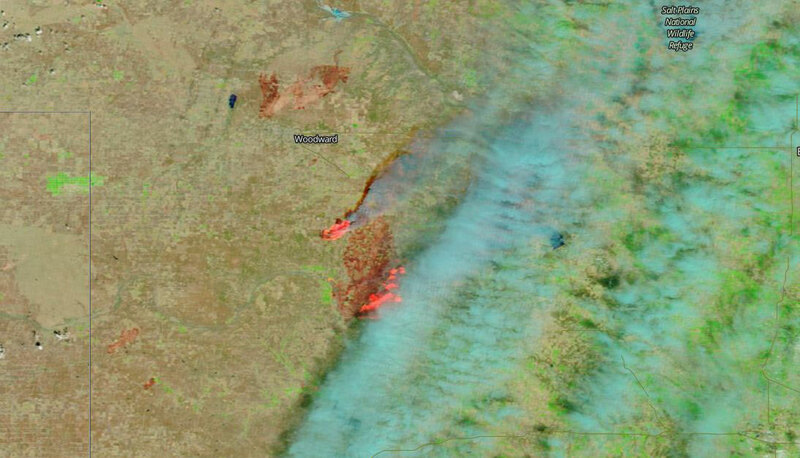 Image of wildfires in western Oklahoma, acquired on 13 April 2018. This false color (Bands 7-2-1), corrected reflectance image was captured by the Moderate Resolution Imaging Spectroradiometer (MODIS) on board NASA's Terra satellite. The actively burning areas are in bright red in the center of the image and the darker red areas are the areas that have already been burned. Visit Worldview to visualize near real-time (NRT) data from NASA's Earth Observing System Data and Information System (EOSDIS).